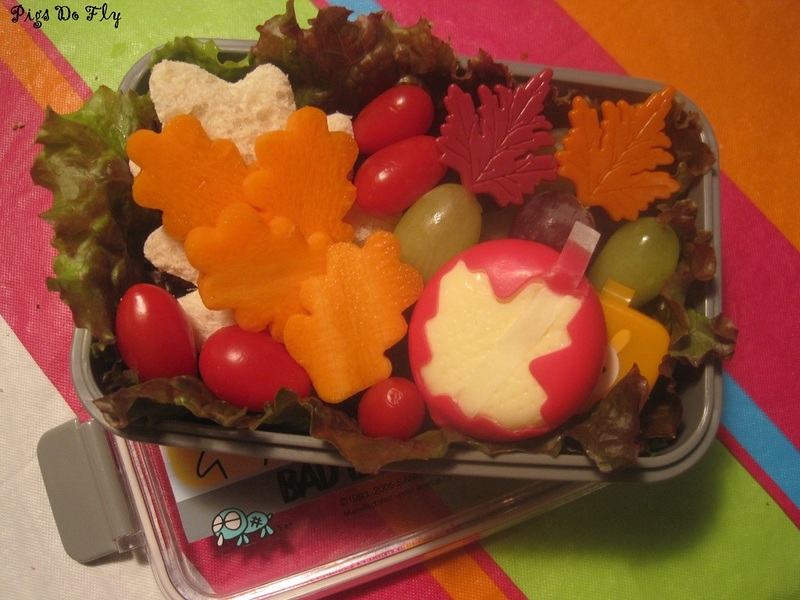 PB and blueberry jam leaf shaped sandwich, grapes, babybel, grape tomatoes and carrots. Another quickie. One of these days I’ll find a little more time again! 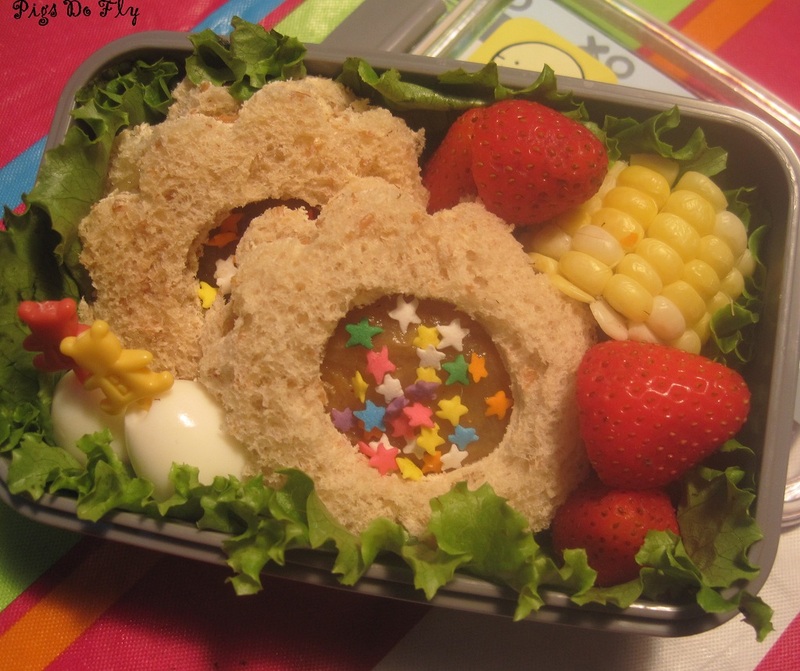 Pb and lemon curd sandwiches in flower shape with candy sprinkles in the center, quail eggs, starawberries and corn. Kidlet complained yesterday that his lunch needed to be bigger, so today I used a large container and packed quite a lot. I don’t expect him to eat it all, but want to see if I can get a sense of what the right amount would be. The 320ml boxes are definitely too small unless I also send a little side car of something. I know the 650ml whatever are too big. The problem is that I haven’t had a lot of luck finding that middle size (480?) in a single layer with locking lids, and I’ve been reluctant to use belted boxes. Just this past summer he was struggling with multi-layer boxes and the one time I tried a belted box, it was a disaster as he still has a tendency to swing his box around and the belt slipped and well, you can imagine the mess! 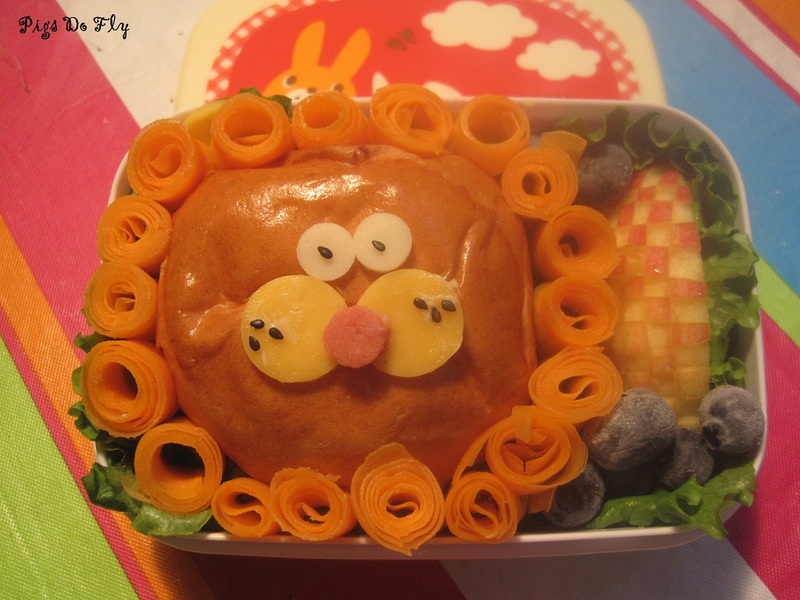 (Really Ugly) ham and cheese rolls, grapes, crackers, carrots, tomatoes and ranch dressing. I bought a new pocket sandwich maker. It’s not much more than a glorified cookie cutter honestly, with just a slightly wider rim for sealing the edges. It does automatically press the facial features in though. I’d wanted to emphasize those by filling them in with some meat and cheese accents and kidlet emphatically said NO CHEESE. How can someone be tired of cheese. Is that even humanly possible. Only bacon exceeds cheese in its culinary greatness in my opinion! 😉 I had to remake the sandwich (which was ham and cheddar) even. Oh well, mom gets a sandwich snack! I will say that I think these types of pocket sandwich makers don’t work nearly as well with American bread as they probably do with Japanese bread, which seems to be somehow smoother looking, denser and more pliable. 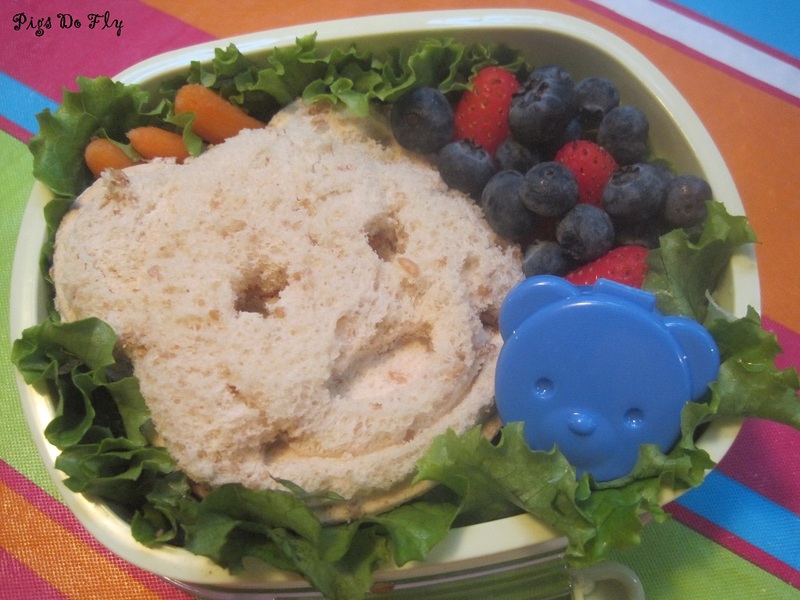 Teddy Bear pocket sandwich (natural PB and homemade low sugar jam), blueberries and strawberries, carrots (quite a few more under the sandwich). 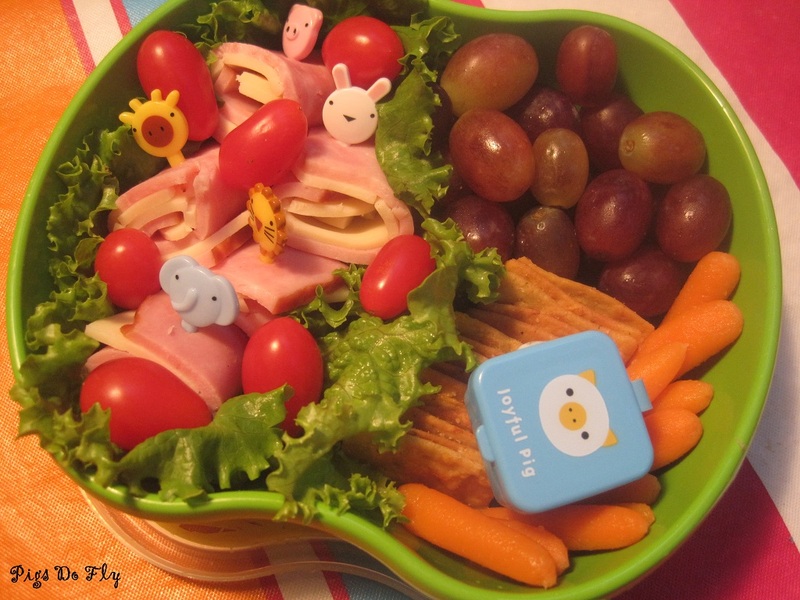 Kidlet informed me that he was tired of cheese and he didn’t want a cute lunch at all. Well, I hope that is just a momentary request! PB and homemade blueberry jam on mini crescent rolls, gold and red raspberries, sungold cherry tomatoes. Egg salad on a butter roll, carrot curls, apple and blueberries. Not much variety in this one. I need to pick up more veggies that he will actually eat. 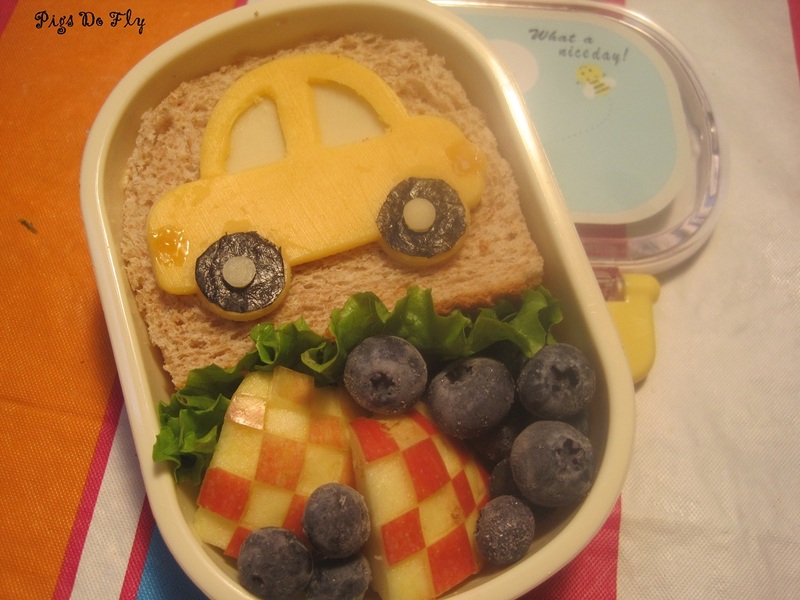 Cheese car with nori wheels on ham and cheese sandwich, checkered apple, blueberries. I had about 27 things to get done last night, none of which did get done. Hubby had to go out after dinner to entertain his project manager who is in from the Chicago area (we’re in Oregon), and keeping up with both kids and getting them both bathed and into bed took a lot longer than normal (DH usually takes care of Kidlet’s nighttime routine). By the time I had them both down and they were actually quiet and asleep, I was just so tired I just wanted to vegetate. Anyway, one of the things I didn’t get done was bento prep, so when we all overslept this morning, I turned to the old standby — the 2 egg shaped cookie cutter pig. 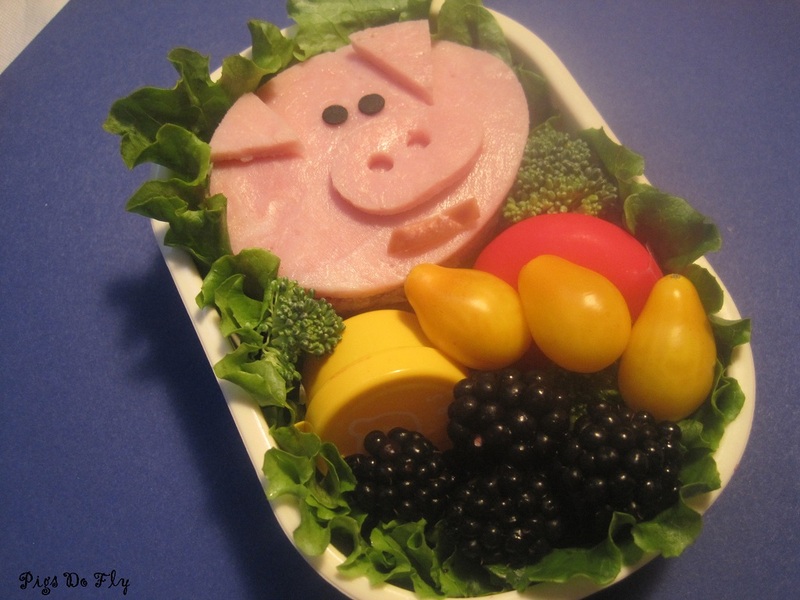 Ham and cheese piggy sandwich, baybel cheese, broccoli and yellow pear tomatoes, blackberries. Spent most of the day at the school today while my mom came in to town to watch Baby L. First I stopped in at the Kindergarten parents “tea” to introduce myself (as the Volunteer Coordinator) and help out the ladies that were hosting it, and then afterwards volunteering in Kidlet’s class today. 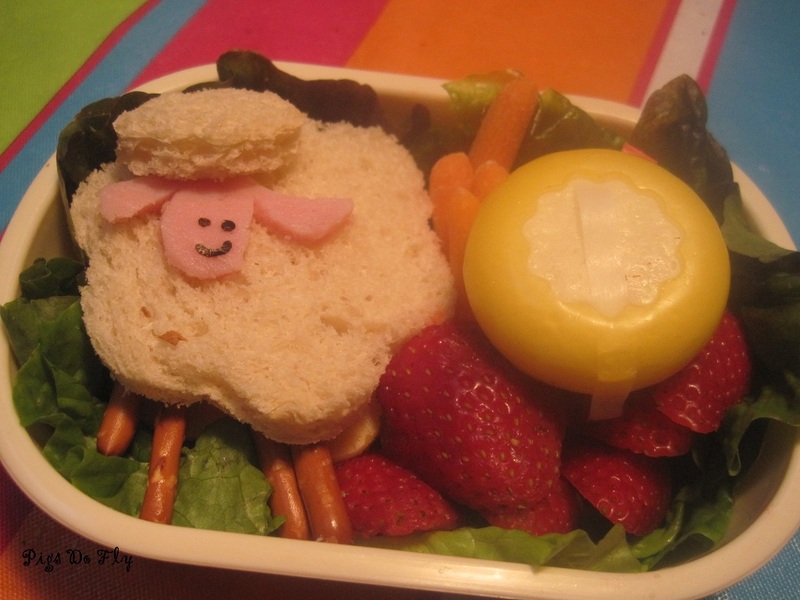 Shockingly, he ate every scrap of this lunch, including the sheep face without peeling off the tiny little nori face. 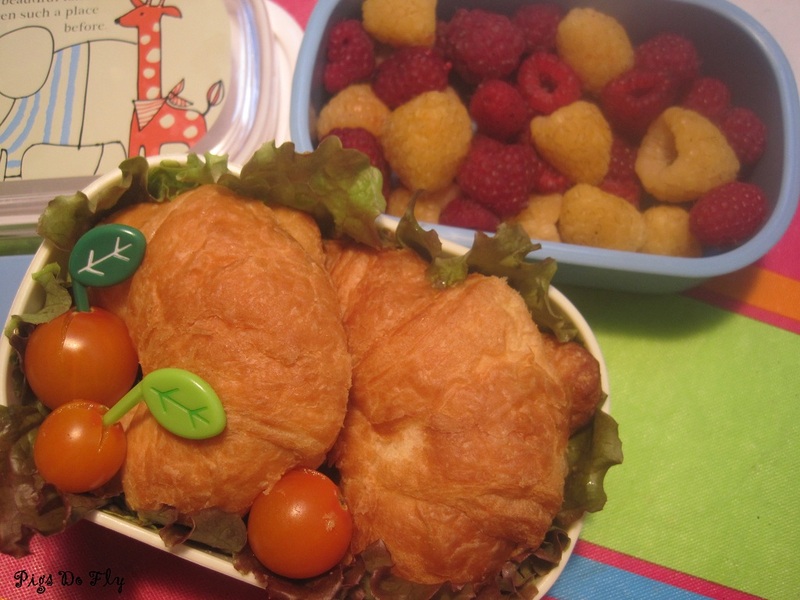 This bento was done in one of our big boxes so that I could fit a whole sandwich with the map on it. I can’t claim credit for the map idea; I saw it done as a quesadilla and just converted it to a sandwich topper for Kidlet’s bento. I put it in the oven on very very low just long enough to soften up the cheese so that the pieces wouldn’t fall off before lunch. It remains to be seen if it dries it out too much and he will or won’t eat it. 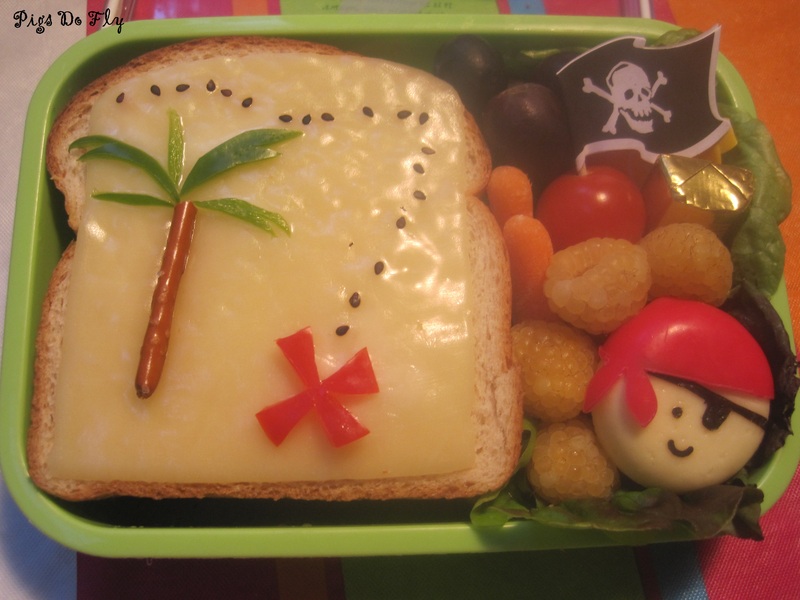 Treasure map ham and cheese sandwich (with bell pepper accents that I know he will pull off and toss). Grapes, blueberries and golden raspberries. Cherry tomato and carrots with ranch. A little golden “treasure chest” of chocolate and a babybel cheese pirate. I really love how he came out, even though kidlet *will* pull off the nori.